St Alfege’s Church is a magnificent historic Hawksmoor church in Greenwich Town Centre. The east end of the church, which faces onto Greenwich Church Street, used to be the main entrance and the front steps flanked by columns which led up to the original doors can still be seen. The entrance is now a small door at the other end of the church and there are two doors to the side. Within the church the suspended flat ceiling with its giant oval panel was once the largest unsupported one in Europe. The pulpit is very lofty and there are beautiful wooden galleries with interesting wrought ironwork. The churchyard lies outside the west entrance and to the north west of the churchyard across a cobbled footpath is St Alfege’s Park, a beautifully planted and tranquil space away from the bustle of the shopping centre. There has been a church on the site for more than 1000 years. It is reputed to be the place where Viking raiders killed Alfege, Archbishop of Canterbury, in 1012. Henry VIII was baptised in 1491 in the second church to occupy the site. In 1710 this medieval church collapsed during a storm – its foundations had been weakened by burials both inside and outside the church. The collapse of the church was one the catalysts for the 50 New Churches Act 1711 and the replacement church was one of the first to be constructed under the Act. It was funded by the coal tax which was a tax on coal ferried up the river which was originally introduced to pay for the rebuilding of the City of London after the Great Fire of 1666. The new church was designed by Nicholas Hawksmoor, completed in 1714 and consecrated in 1718. The tower that Hawksmoor designed for St Alfege’s was not built because of a lack of funds. Instead the church was built against a surviving tower and the steeple designed by John James in 1730. Hawksmoor’s design for the tower was later incorporated into St Anne’s Church Limehouse. St Alfege’s Church was badly damaged by firebombs during the Blitz but restored in 1953. 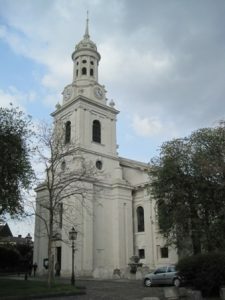 St Alfege’s Church is often open to the public with regular free lunchtime recitals on Thursdays and Saturdays and frequent concerts on other days of the week.